This section contains information and instructions for a software-based deployment of Websense Web Filter or Web Security. In this deployment scenario, all Websense components are installed on servers in your network. Websense components are typically distributed across several machines. Websense Web Filter or Web Security software consists of components that work together to monitor Internet requests, log activity, apply Internet usage filters, and report on activity. Websense software is highly distributable, providing the flexibility to scale a deployment to suit your needs. Components can be installed together on one machine for smaller organizations; or they can be distributed across multiple machines, and multiple sites, to create a high-performing deployment for larger organizations. The appropriate deployment is determined by network size and configuration, Internet request volume, hardware performance, and filtering needs. The following illustration is a high-level diagram of a basic software-based deployment of Websense Web Filter or Web Security. Note that this illustration is intended to show the general distribution of components and does not include network details (such as segmenting, internal firewalls, routing, switching, and so forth). Websense filtering components may be installed on the same machine or distributed across several machines. Additionally, you can install multiple instances (on different machines) of certain components, to scale to your organization's needs. Web Filter or Web Security can be integrated with a number of third-party proxy, firewall, and router products (such as, Microsoft ISA Server/Forefront TMG, Cisco PIX, and Squid Web Proxy Cache) or Citrix application servers. Note that an integration product is not represented in the illustration above. The integration product communicates with Websense Filtering Service to evaluate whether the Internet requests passing through it should be blocked or allowed. See System Requirements for a list of supported integration products. If you do not use an integration product, Websense Network Agent can be used to monitor and filter HTTP/HTTPS/FTP requests. Microsoft SQL Server is used to store Websense data (including log and reporting data). SQL Server must be obtained separately; it is not included as part of a Websense subscription. When you are installing Websense components, SQL Server must be already installed and running, typically on its own machine, as shown above. SQL Server Express (installed using the Websense installer) may be used in place of SQL Server. However, it is a best practice to use SQL Server Express only in non-production or evaluation environments. 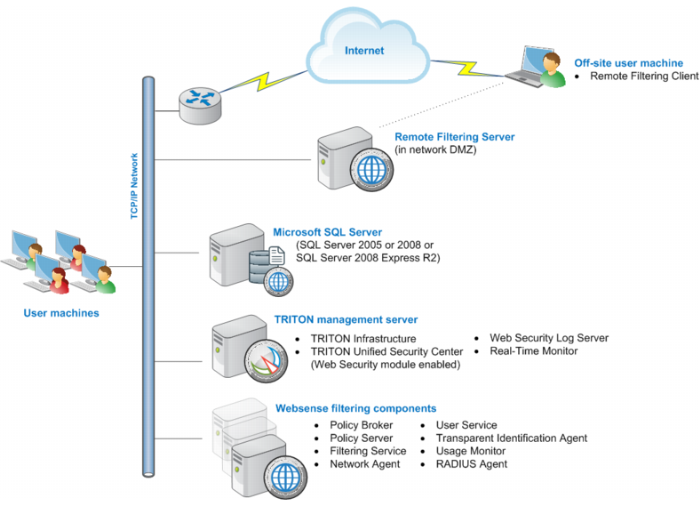 TRITON management server is the term used to refer to the machine on which TRITON Unified Security Center is installed. This machine is used to manage your Websense deployment. It includes TRITON Infrastructure and any or all of the TRITON Unified Security Center modules (Web Security, Data Security, and Email Security). Additional components may also be installed on the management server, for example, Web Security Log Server and Real-Time Monitor. (Note that these components may be installed on another machine; they are not required to be located on the TRITON management server). Websense Remote Filtering Server is typically installed on its own machine in the network DMZ. Remote Filtering Server is used, in conjunction with Remote Filtering Client, to filter off-site users who are outside the corporate network (such as traveling personnel or telecommuters). It is possible to install TRITON management server and Websense filtering components on a single machine, rather than distributed as shown above. See Web Security All. Complete the following main steps (the links go to detailed procedures or information for each step). Important: Be sure to install Policy Broker and Policy Server before creating a TRITON management server (in the next step). Important: When following the instructions under Creating a TRITON Management Server, choose to install only the Web Security module of the TRITON Unified Security Center. 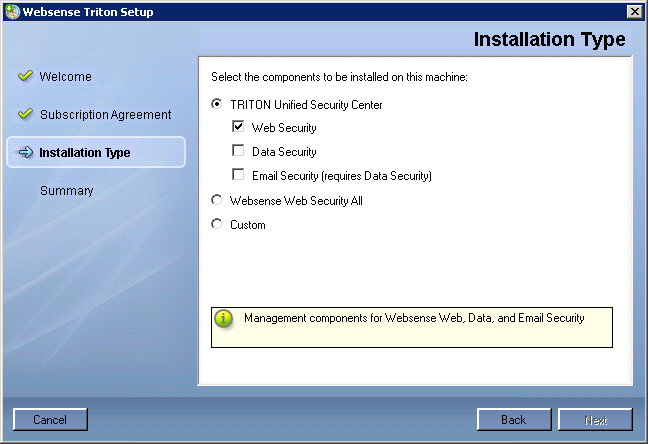 When you reach the Installation Type screen of the Websense installer, select only Web Security (under TRITON Unified Security Center). You can choose to install the other modules of the TRITON Unified Security Center. However, they will be enabled only if the subscription key you enter includes those features.